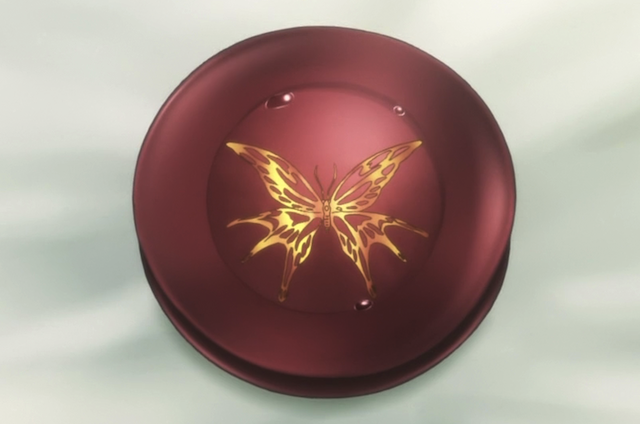 Used sake cups, emblazoned with Hirasaka group's symbol. Episode 3 of Kami-sama no Memo-chou (God’s Notebook) wraps up the second adventure. Rather than dwelling on the plot, or character growth, I focus here on an interesting ceremony that takes place. I really did not see this twist coming. One thing apparently leads to another, and Narumi asks Yondaime if he can join his gang, the Hirasaka group. I was surprised not only because Narumi asked such a thing, but also because of the way that he asked. 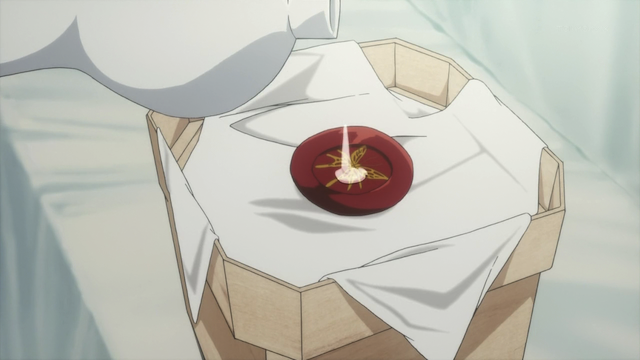 Narumi asked to share sake with him. 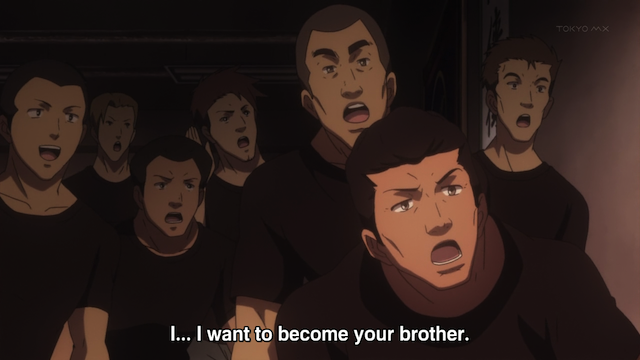 This was apparently well understood by Yondaime, who angrily refuses at first, re-iterating what he said in the last episode, that students were not allowed in the organization, but when Narumi insists he doesn’t want to be a member of a gang, but be the Yondaime’s brother, he is welcomed in. Setting aside Narumi’s reasons for joining, and the Yondaime’s reasons for accepting him, I was really interested in why the Yondaime knew what Narumi was talking about, when he said he wanted to “share the sake”. Ceremony preparations complete -- awaiting the guests. The guests file in. 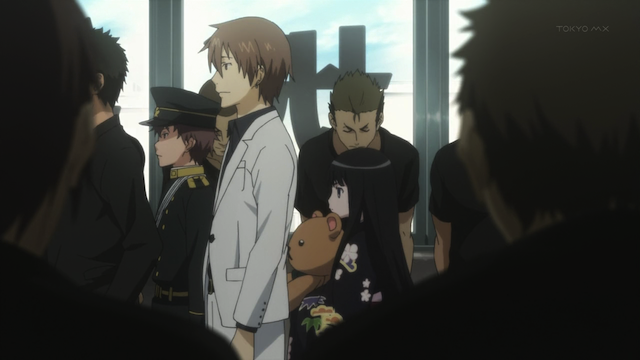 Notice the major's dress uniform and Alice's kimono. 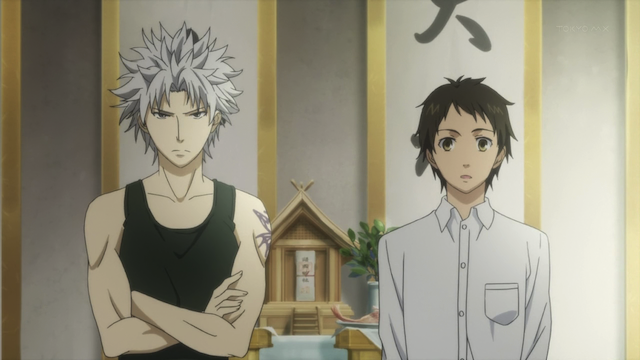 Yondaime (left) and Narumi (right) stand in front of a shrine. I tried looking for information about Japanese gang customs on the ‘Net that involved sake, but mostly found references to the ritual drinking of sake in a wedding ceremony, dating from Shinto practice. As this website explains it, “People drink Sake in order to make human bonds strong”. Drinking sake at a wedding symbolizes the mingling of the different families into one. You can’t quite see it in the above shot, but the shrine has some very specific items set before it. From our perspective, to the right is a plate of fish, and to the left is a plate of wrapped money (not paper currency, the metal currency you see in Edo-period dramas). 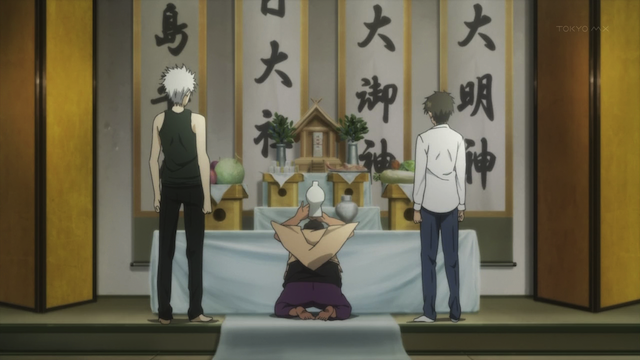 A priest (or gang member taking that role) offers the sake first to the shrine. The sake is poured into the ceremonial cups, and then handed to the ritual participants. 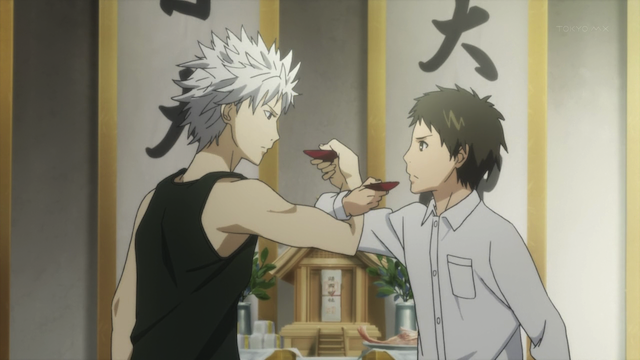 The Yondaime and Narumi drink the sake together. The “sake” used was actually mineral water. Regardless they act out the ceremony, including the hooked elbow drink that Yondaime says was originally inspired by a film called Renha. Narumi says he knows it, so I guess it is somewhat famous. I looked for information about this movie online and didn’t locate a thing. After the two drink from the ceremonial cups, the two cups are placed together (as can be seen in the screen shot at the top of this post). Alice prepares those in attendance for the final ritual of the ceremony. A single clap in unison. 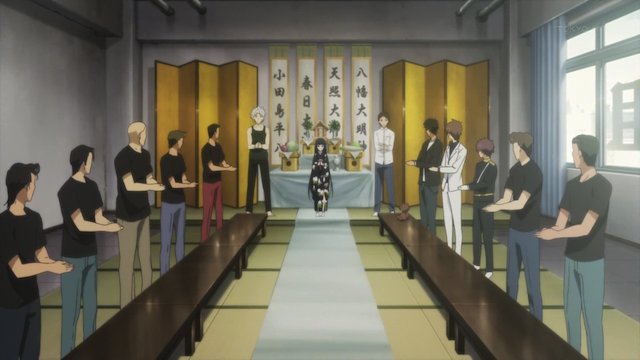 Alice steps up, makes a short speech which embarrasses both Narumi and the Yondaime, then leads the hall in a single synchronized clap. Many religious customs, including Japanese Shintoism, include the production of sound as a representation of the presence of divinity. In addition, this ritual seems designed to involve all those in attendance as participants in the ceremony. This whole event was very interesting, and very foreign to me. I can only assume that at least some of the things that were surprising and mysterious to me, would have been understood as common cultural referances to a native Japanese audience. I really like this Anime, and Alice is very Kawaii jeje. 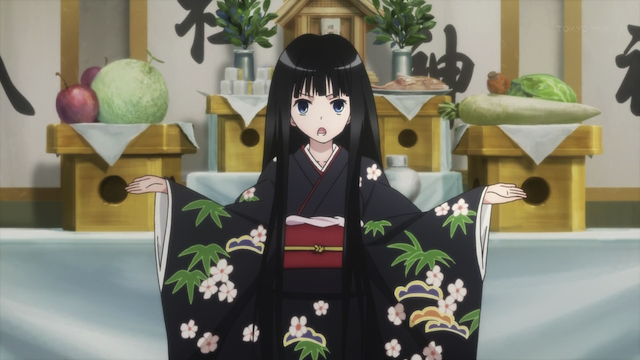 like the black kimono with which she appears on that episode. Is a great anime!! I’m enjoying this show as well. 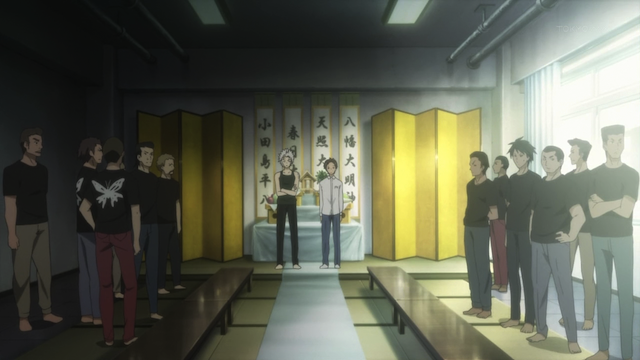 This kind of ceremony is often featured in Nurarihyon no Mago, where the various monster clans are organized as yakuza gangs. When Rikuo wants to recruit a monster into his group, he exchanges sake with it. I wonder what the exact nature of the Hirasaka group is. Are they supposed to be a Yakuza group? Are they something else (like a gang, but not a criminal organization)? It is implied that the members are mostly young people who might otherwise drift into criminal activities.